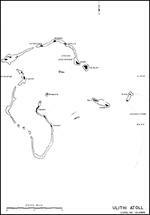 ww2dbasePalau Islands were under German control from 1899 until the end of WW1. After the WW1, Japan was given mandate of the group of islands. While Douglas MacArthur of SOWESPAC advanced by taking Morotai, Chester Nimitz of CINCPOA made his move in his theater on the same day by landing General Geiger's III Marine Corps on Peleliu of the Palau Islands. In mid-Sep, the weather was hot and humid; even with the frequent rain, the temperature persistently remained at 115 degrees Fahrenheit. ww2dbaseThe pre-invasion bombardment on Peleliu was relatively useless; the shells that rained on the island could not touch the well dug-in Japanese. A gunnery officer recorded that his crew fired five salvos of 8-inch shells at a coastal gun emplacement protected by hard coral only to find the Japanese pushing the coastal gun back out to return fire at the Americans. Nevertheless, Marine officer William Rupertus who oversaw the invasion operations still held an optimistic view. "We're going to have some casualties, but let me assure you this is going to be a short one, a quickie," he said. It turned out that it would not be the case. ww2dbaseThe US Marines departed on LST landing craft from Pavuvu for Peleliu in the morning of 4 Sep 1944. The journey was 2,100 miles in distance, and it was made uneventfully. When they arrived at Peleliu, they found the landing beaches a "frightful spectacle. Huge geysers of water rose around the amtracs ahead of us as they approached the reef. The beach was now marked along its length by a continuous sheet of flame backed by a thick wall of smoke." When the landers made it to the beach, they found themselves targets to overwhelming machine gun and rifle fire. Every so often, artillery shells flew in from behind the lines, sending fragments everywhere and occasionally scoring hits on American landing vehicles. Through this most hostile scenery, the Americans secured a beachhead to advance their operations. ww2dbaseThe Japanese by now realized the strategy Lieutenant Colonel Naoyuki Kuzume employed at the island of Biak was the most effective in discouraging further American advances across the Pacific Ocean. It was a war of attrition. After Biak, Peleliu was the first battle where fighting from the depths of intricate caves was the official doctrine. The Japanese troops were told to dig deep, hold their fire during the initial landings, and only attack when they could counterattack and infiltrate American lines. On Peleliu, the Japanese followed just the orders, and the American officers helped them by growing arrogant and careless after their recent victories. The Americans, however, learned very quickly that they could not clear caves by throwing in explosives or using flamethrowers anymore, as the Japanese had also improved their cave digging techniques so that slanting cave entrances deflected the damaged caused by such weapons. As a result, the 11,000 Japanese troops fought from their labyrinthine caves for two and half months, counterattacking whenever they had the opportunity. One of the more notable counterattacks to the American Marines was a counterattack spearheaded by 13 light tanks and a company of men. The extremely well-coordinated tank-infantry attack breached the American perimeter and moved across Peleliu's main airfield, nearly dividing the American forces there in half. They were finally stopped at the last yard by well-aimed 37mm anti-tank guns and the arrival of a dive bomber. Failing to take the airfield, Japanese mortar and artillery punished the Americans holding it. "To be shelled by massed artillery and mortars is absolutely terrifying", said United States Marine Corps veteran Eugene Sledge, who fought on Peleliu, "but to be shelled in the open [at the airfield] is terror compounded beyond the belief of anyone who hasn't experienced it." ww2dbaseAs the Japanese strength began to dwindle slightly, a new tactic was put in effect. Their defense of Peleliu became one of strict fire discipline. There would be times when things were so quiet that for a moment it seemed the war was over, but as soon as a small group of men gathered, or someone carelessly moved their head above the tip of the crater they were crouched in, Japanese mortars and rifles came to life. As a result, the Japanese were able to cause maximum casualty with the least amount of fire, which also minimized the rate of detection by the Americans. ww2dbaseOne of the most difficult areas on Peleliu for the Americans was the Umurbrogol Mountain. However, no American Marine called it by its proper name; instead, the name "Bloody Nose Ridge", sometimes simply "Bloody Nose", was used. The hard rock was stripped of the little vegetation there were by naval bombardment, and when the Americans reached the ridge they realized the bombardment had created so many rock fragments that they multiplied the effectiveness of Japanese mortar and artillery by increasing the amount of shrapnel flying in the air. The advance up Bloody Nose Ridge cost the US 1st Marine Division's three companies 538 casualties out of a total of 612; when they were reinforced by platoons of the 7th Marine Division, they found that the newly arrived were immediately pinned down just like they were, taking casualties immediately. ww2dbaseThe combat at Peleliu was most brutal, with both sides fighting in the most violent manner. Sledge commented that the Marines were fighting with the deepest of hatred toward the Japanese in their hearts. "To deny this hatred or make light of it would be ... a lie", he said. The collective attitude, Marine and Japanese, resulted in savage, ferocious fighting with no holds barred. This was not the dispassionate killing seen on other fronts or in other wars. this was a brutish, primitive hatred, as characteristic of the horror of war in the Pacific as the palm trees and the islands. ww2dbaseOn 28 Sep 1944, American Marines boarded amtracs and traveled 500 to 700 yards of shallow water to the nearby Ngesebus Island, where Japanese artillery were based. The landing operation at Ngesebus was support exclusively by Marine aircraft. The Corsair of marine Fighter Squadron 114 unloaded their bombs and rockets on the Japanese positions, then strafed everything that moved. Meanwhile, one battleship supported by cruisers and destroyers bombarded areas inland to soften the defenses further. The fighting was tough in the ridges and caves of the island, but the Marines were able to keep casualties to a minimum. When the island was secured several days later, the Americans suffered 15 killed and 33 wounded. The Japanese, however, suffered 470 casualties in the face of superior firepower. ww2dbaseOn 3 Oct, the Marines attacked the Five Sisters, a group of coral hills with five tall peaks. The Marines advanced steadily, but the Japanese sniper fire was so intense that casualty rate was extremely high for the Americans. Very soon, the Japanese realized that it was advantageous to shoot the stretcher bearers, for that it would force the Americans to set aside at least two men as stretcher bearers to bring the downed man back. Again, the Japanese practiced extremely good fire discipline, firing only when they could inflict maximum casualties. "When they shot, someone usually got hit." At night, however, it was a different fight. Japanese infiltrators persistently tested the front lines, slipping into foxholes quietly and sometimes slitting throats of unsuspecting Marines. To counter this night tactic, the Americans practiced good discipline of their own. No one was allowed to move about after dark to minimize friendly fire, while two-man foxholes were dug so that one could sleep while the other maintained watch. Still, Japanese soldiers continued to pose as a serious threat, silently wearing away American morale with the night attacks. ww2dbaseOn 12 Oct, the Americans declared that the assault phase of Peleliu complete. It was met with protest from the front line men. "Somebody from the division CP needs to come up here and tell them damned Nips the 'assault phase' is over," grumbled one man as recalled by Sledge. Weeks more of fighting remained ahead of them before the last Japanese pocket of resistance was defeated. In fact, a few Japanese kept fighting far after the war was over, not surrendering until 11 years later. ww2dbaseWhen the soldiers of the 2d Battalion of the 321st Infantry Regiment of the US Army 81st Division arrived for relief on 15 Oct 1944, they were welcomed whole-heartedly by the exhausted Marines. Although by that date the Marines had already reduced the Japanese resistance to a area of 400 to 500 yards wide deep in Umurbrogol Mountain, the men of the 81st Division faced an enemy as tough as the Marines had faced on the first day of the landing. The Japanese fighting spirit was so fierce that Major General Roy S. Geiger of the Marines repeatedly noted Peleliu was the toughest battle of the entire Pacific War. Most veterans of the battle, even the few older men who had seen combat in the ferocious trenches of WW1, agreed. ww2dbaseThe invasion of the island of Angaur took place two days after Palau was landed, on 17 Sep. Fortunately for the US Army 81st Division that was tasked with taking control of the island, only 237 men were lost before the beachhead was fully secured, a very different situation than the operation on Peleliu. Even while the American invaders were clearing the mountains of the remaining Japanese troops, an airfield was under construction which would later aid the Leyte campaign. ww2dbaseWhen the Battle of Peleliu was over, the Americans suffered over 10,000 casualties, with 2,336 of them killed. The US 1st Marine Division suffered the highest casualties at 6,526 men, with 1,252 killed. Although the Army 81st Division did not arrive until a month after the landing, the Japanese still caused 3,278 casualties among them, with 542 killed. The Japanese lost an estimated 10,695 men on the island, with only 302 survived as prisoners. Of the 302 prisoners, however, only 19 were Japanese combatants; the others were all construction workers of various ethnicities. ww2dbaseAlthough the Palau Islands were valuable for the subsequent Philippine operations, many historians argue that the overall operation was useless in the grand scheme of the war. The Japanese on this island "could have been left to wither on the vine without altering the course of the Pacific War in any way", argued William Manchester. In fact, such a notion existed. William Halsey radioed Chester Nimitz that the Palau operation should be canceled and the forces should concentrate on Leyte, Philippines, instead. Nimitz, while endorsing Halsey's views, still continued the operations against Palau Islands. ww2dbaseBesides the argued importance of Peleliu, another reason why the Peleliu operation remain one of the lesser-known battles of the Pacific War was the US Navy and US Marine Corps' original thought that it was to be an easy operation. Major General William H. Rupertus predicted that Peleliu would be secured within four days. Because of that prediction, only 6 of the 36 journalists with him bothered to go ashore, and in turn very few reports about Peleliu made it into American newspapers. ww2dbaseAfter the war ended, Palau Islands remained under American control until 1994.
ww2dbaseOn 21 Sep 1944, seeing the relative ease of the Angaur portion of the Palau Islands operation, William Halsey diverted the men of US 81st Division who were originally held as reserves to Angaur for an additional operation against Ulithi Islands. Ulithi Islands were to Palau Islands' northeast, among the westernmost of the Caroline Islands. 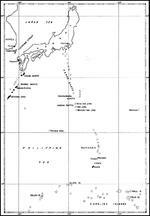 The Ulithi Islands had been a Japanese radio and weather station early on in the war, and through the course of the war the lagoon was also used as an anchorage. Some time in 1944, the Japanese evacuated the islands in the face of overwhelming American pressure. ww2dbaseOn 23 Sep 1944, an US Army regiment landed on Falalop Island of the Ulithi Islands unopposed. A few days later, an US Navy Construction Battalion, "Seabees", arrived along with survey ship AGS-5 Sumner. 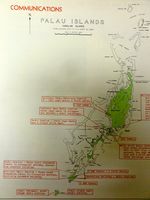 Building of a new airfield on Falalop Island began almost immediately, and by the time of the Philippine Islands operations later that year, the lagoon was built up to service more than 600 ships concurrently. The civilians of Falalop were relocated to Fedarai Island, also of Ulithi, and did not return until the end of the war. ww2dbaseSources: American Caesar, Goodbye Darkness, the Pacific Campaign, Wikipedia, With the Old Breed. 30 Mar 1944 USS Portland screened fleet carriers as their aircraft struck enemy installations located in the Palau Islands, Caroline Islands. 31 Mar 1944 USS Portland screened fleet carriers as their aircraft struck enemy installations located in the Palau Islands, Caroline Islands. 1 Apr 1944 USS Portland screened fleet carriers as their aircraft struck enemy installations located in the Woleai, Caroline Islands. 29 Apr 1944 As part of US Navy Carrier Task Force 58, USS Portland screened carriers launching strikes against Truk in the Caroline Islands. 30 Apr 1944 As part of a cruiser task group under Rear Admiral Jesse Oldendorf, Portland participated in the bombardment of Salawan Island in the Carolines. 12 Sep 1944 USS Portland and Cruiser Division 4 begin pre-invasion bombardment of Peleliu in the Palau Islands. Bombardments continued for 3 days until the US 1st Marine Division landed on the island. 15 Sep 1944 The US Marines invaded Peleliu in the Palau islands believing that the island was only lightly defended. In fact, there were some 12,000 Japanese concealed on the island waiting to reveal their hand. In a week the Marines would suffer terrible casualties. The 1st Marines ended up at half their combat strength and, in the 5th and 7th Marines more than four out of every ten men sent ashore were either killed or wounded. For the record Peleliu measured just six miles long and two miles wide and was of questionable strategic value. 28 Sep 1944 USMC landed on Ngesebus of Palau Islands to eliminate a Japanese artillery position. Palau was actually called Peleliu. Palau is not called Peleliu. Peleliu is an island within the Palau group. Peleliu...one of the worst and most worthless battles of the Pacific war. 10,000 American lives were lost for a worthless island with no useful purpose. Most were lost at Umerbrogul, or Bloody Nose Ridge, a ridge of bare coral with the Japanese dug in like on Iwo Island, like many of their island holdings, in fact. Dont forget about the men on the LCIs who risked their lives delivering the Marines and Army to the battles. My dad was on an LCI landing craft and later an LCI gunboat. After reading about this battle, I realize we were extremely lucky to have him come home. "10,000 American lives were lost for a worthless island with no useful purpose." Actually, 2,336 died, the rest were wounded or missing (presumably dead). Our family's beloved Leon (Lee) Szetela was killed in action 22 Nov 1944 on Peleliu. Anyone out there know him or serve with him? A lot of the text in this story comes right out of Samuel Morrison's Two Ocean Navy. The quote cited to Manchester also comes from Morrison. My father, Raymond Elton Douglas, Kalamazoo, MI. k-3-5 Ist Marine division. Fought Peliliu and Okinawa, where he was wounded twice in same day.I have one pic of him and buddies on Peliliu. Any one out there who knew him? Thanks to all who served, God bless you. William Douglas ~ My Father Pfc Garner Mott was wounded on the airfield on Peleliu 9/16/44 . He was KIA May 7, 45 Okinawa . I was 10 months old . I have been with and met the guys of K-3-5 his company . My Beloved Father in Law W. S. "Willie" Francisco was with the 323 Combat Infantry Batallion of the 81st Infantry Division! He was a BAR man for his squad. He always said he lost a lot of his Buddies, for a worthless piece of sand & dirt! My friend was in med school in Madison, WI and he enlisted in the Navy. They tfrd him to the Marines due to his med training. He told me a lot about Peleliu. Dr. Gordon Paton is now deceased. But he was "up front" most of his service on Peleliu.